Built on the ability to produce short-run stampings, Quick- has in recent years invested heavily in metal-fabrication equipment--CNC turret punch presses, press brakes and laser-cutting machines (all from Amada). 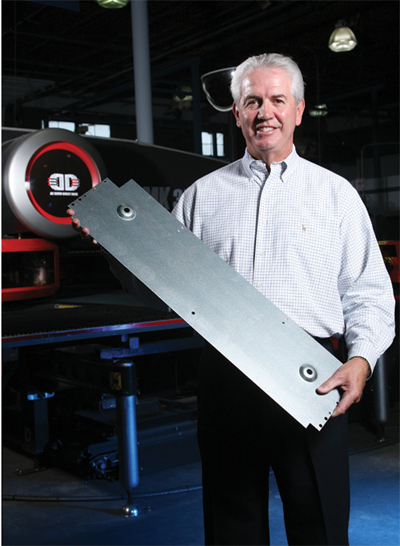 "Fabrication opens new doors for us," says president ne Boeckman, PMA chairman for 2009, shown holding a fabricated metal part for an electrical box. decided long before ne Boeckman landed there as president earlier this year that it had to expand its core competencies in order to grow and prosper. That’s why four years ago the firm invested heavily to grow into metal fabrication—turret punch presses, press brakes and laser-cutting machines. That willingness to expand into new markets, develop new ideas and learn to make new types of parts is what attracted Boeckman to the company. He joined Quick- after selling his metal-spinning company, Texas Metal Spinning, Inc. (TMSI), in 2006 following 20 years as owner. Now he brings his diverse background to PMA, as chairman for 2009. 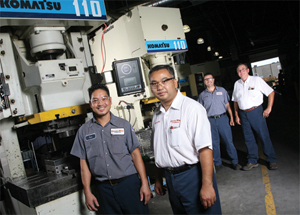 A lineup of newer Komatsu C-frame stamping presses keeps Quick-’s short-run stamping business cooking. Shown are press operators (blue shirts) Francisco Valdez (rear) and Ngoung Tran; and supervisors Bob Bundick (rear) and Phouvong Souyavong. As an example, Boeckman cites the recently forged partnership between PMA and the National Tooling and Machining Association (NTMA) to combine their federal-government advocacy programs. PMA and NTMA now will lobby as one to promote government policies that ensure a strong U.S. manufacturing sector. PMA has an aggressive advocacy agenda for 2009. A top priority will be stopping the business-killing “card check” legislation proposed by labor unions. The legislation would strip workers of their right to a secret ballot as part of a union-organizing drive and expose them to intimidation from union bosses. “We’re working on legislation that would give U.S. industrial consumers a voice in trade law,” Boeckman says. “The legislation would give American manufacturers a seat at the table by providing standing to industrial consumers of raw materials to participate in anti-dumping and countervailing duty cases and in 5-year sunset reviews before the U.S. Department of Commerce and the U.S. International Trade Commission.” Additionally, PMA is fighting for permanent extension of the R&D tax credit, full funding for Manufacturing Extension Partnerships (MEPs) to help small companies improve their operations, health-care reform, trade-law enforcement, workforce training programs, permanent repeal of the estate tax and the elimination of burdensome regulations. The R&D tax credit is an issue near and dear to Boeckman, as it represents just one benefit, among many he cites, that he has realized thanks to his PMA membership and his active involvement in association activities. 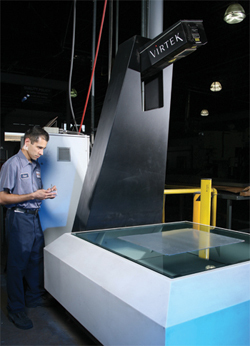 Laser inspection on this Virtek Laser QC allows Quick- laser-cutting-machine programmer Jason Martinez to quickly and accurately perform first-article inspection on any flat part during the initial phases of manufacturing. evening was Scott Schmidt, of the Black Line Group. This company, a PMA partner, specializes in working with small and mid-sized businesses on how to pursue the R&D tax credit, an area I knew nothing about. I soon came to realize that I had been missing out on a huge opportunity to get a substantial credit for a lot of the new projects we were tackling at TMSI. “While at TMSI, what we saved with the R&D tax credit, thanks to what I learned from Black Line at that PMA event, probably paid my PMA dues for 15 years or more,” Boeckman says. Boeckman eventually became chairman of the division for 2002-2003, served on the PMA board of directors, the PMA Executive Committee and chaired the PMA Lone Star District from 2004 to 2005. “While at TMSI, we had several employees actively involved in PMA activities, to learn from their peers in different areas of the business how to do things better,” Boeckman says. “We had our quality-control people, our office manager, and three or four guys from the shop all attending PMA events and training sessions, bringing back to TMSI new ideas and new opportunities to expand our opportunities,” he says, re-establishing his theme as 2009 PMA chairman. “It’s also been my pleasure to serve on the board of PMA’s Educational Foundation for the past year. As critical as it has been for PMAEF to continue to address the industry’s needs, by promoting careers in the metalforming industry and providing products and services that companies and educators can use to educate and train incoming and incumbent workers, the foundation’s work will be even more critical in the years to come. Data show that the average age of skilled employees in the metalforming industry is 55, and by the year 2030 experts project a nationwide shortage of 14 million workers throughout manufacturing. That, coupled with continuously increasing demands for employees to have more skills at a higher level to maximize the capability of new technology, makes it apparent that the health of our industry is tied directly to its employees. PMAEF also produced 27 seminars during the last fiscal year, which attracted more than 700 registrants, the highest total in eight years. Growth in this area will continue in 2009, with 34 seminars scheduled, “six of which are brand new programs addressing new topics identified by the industry as most needed,” explains Boeckman. Led by 41-yr. employee and director Eldon Bottom, a production team at Quick- discusses advantages gained by switching short-run production of the transmission component in Bottom's hand from five hits in a stamping press to fabrication using laser cutting, punching on a turret press and forming on a press brake. 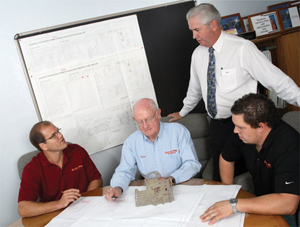 Shown (from left): Mike Lund, Quick- vice president; Bottom; president ne Boeckman; and Jason DeArmond, manufacturing manager. The foundation also looks forward to introducing a new technical conference next spring, taking advantage of the time slot created in March or April as the METALFORM exhibition moves to November 2009 to join with FABTECH International and the AWS Welding Show in Chicago, IL. “Also, for the first time in 2008, the Educational Foundation addressed management-level training,” says Boeckman, “by offering webinars to improve the skills and leadership abilities of individuals working in senior management, customer service, sales and marketing, financial services, human resources and workforce development.” This was done through a partnership with organizations including Kiplinger Washington Editors, Harvard Business School and CRK Interactive. Also in 2008, PMAEF introduced a new curriculum, Occupational English for Metalforming, developed in the PMA Twin Cities District through a foundation grant. This program teaches non-English speakers the English they need to know in order to succeed in the metalforming industry, regardless of their native language. The Educational Foundation continues to develop tools that companies and educators can use to foster learning. The newest example is the Tools of the Trade series. “These simple, easy-to-use PowerPoint slides serve as instructional resources to enhance existing programs, or they can be the basis for developing new training,” says Boeckman. They cover topics such as safety, metalforming basics, quality, measurement and prints, and communications and teamwork. Boeckman participated in the ICOSPA 2008 Congress, held in September in Grand Rapids, MI, an international meeting of metalforming executives organized once every three years by the International Council of Sheet Metal Presswork Associations (ICOSPA). With 370 delegates from nine different countries, the four-day event put PMA in the spotlight as many of its member companies (and its staff in Cleveland, OH) worked tirelessly for more than a year to prepare a program of keynote speakers, plant tours and networking events designed to promote global relationship building and opportunities to—once again—expand into new markets, explore new ideas and develop new products. ne Boeckman describes the theme for his year at the helm of PMA—Expanding Opportunities—as being critical to the success of the association and of its member companies. He clearly lays out a vision of growth and financial success based on a willingness to expand into new markets, develop new products and implement new ideas. That philosophy is exactly what got Boeckman to where he is today: former owner of a highly successful metal-spinning company, current president of a small-lot stamping and metal-fabricating company, and PMA chairman of the board for 2009. Boeckman began his career in Ft. Worth, TX, in public accounting after earning his B.S. degree from the University of Kansas in 1972. After four years of performing audits, primarily for manufacturing firms and banks, and some tax work, he joined Fort Worth Pipe & Supply (FWP), A Division of Whittaker Corp. as controller. Less than two years after joining FWP—a processor and distributor of oil-field pipe—Boeckman became the firm’s vice president of operations and a year later, in 1978, he played an integral role in management’s decision to purchase its own pipe mill, “the single largest capital investment that Whittaker had ever made,” he recalls. That decision serves as a foundation for Boeckman’s belief that expanding opportunities (reaching into new markets, developing new products and implementing new ideas) is what allows companies to grow. “It’s what will allow PMA and its member companies to grow,” Boeckman stresses. After a seven-year stint with FWP, Boeckman moved to Canton, OH, to take on the role of president of an aluminum foundry and machine shop, also a division of Whittaker Corp., that manufactured aluminum cylinder heads and intake manifolds, primarily for Chevrolet. “Again, to grow the business, we had to expand our opportunities, develop additional core competencies and expand our customer base,” Boeckman says. During his four-year stay, the company moved decisively into the marine-engine market, and also developed expertise in assembly, including aluminum dip brazing to fabricate tubular intake-manifold assemblies. After four years and four Northern Ohio winters, Boeckman’s entrepreneurial sprit took hold and he went in search of a Texas company he could acquire, to apply his combined experience and expertise in finance and in operations management. In January 1987, he acquired Texas Metal Spinning, Inc. (TMSI), in Ft. Worth, and immediately launched the company up a steep growth curve. “We grew by 30 to 40 percent per year for several years,” says Boeckman. “In just two years, we exceeded the seven-year sales projections I had set for the company.” Investment in CNC/playback-controlled metal-spinning machines (from German manufacturer Leifeld) supported the firm’s accelerated growth curve, allowing it to increase sales ten-fold (to $7 million) while only increasing the size of its workforce from 10 employees in 1987 to 35 employees when Boeckman sold TMSI in 2006. So why the move to Quick- Stampings, Inc. of Texas, after years of successfully owning and operating his own metalforming company? “I came here because Quick- management is willing to look into new opportunities and explore new ideas for growth,” Boeckman says. “We’ll develop new products, new skills and new capabilities. For example, while the company was built on the ability to produce short-run stampings, it has in recent years invested heavily in metal-fabrication equipment—CNC turret punch presses, press brakes and laser-cutting machines. Fabrication opens new doors for us, lets us reach new customers and explore new opportunities to grow.